Thirteen people were hospitalized after a school bus crashed on I-95 in Greenland, New Hampshire. 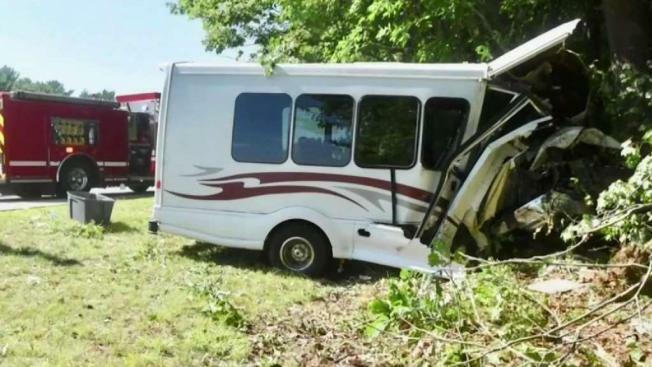 A bus driver had an apparent medical episode before driving off the side of Interstate 95 in New Hampshire and crashing into a tree with multiple children on board Friday morning, according to state police. The crash happened on I-95 south in Greenland around 9:30 a.m., and has resulted in several lane closures as emergency crews respond to the scene. Eleven children were on board the bus, and state police say they are "bumped and bruised" but most suffered no serious injuries. The driver, John Guy, 21, of Kittery, Maine, and a camp counselor, is "in rough shape," according to police. "It appears the vehicle drove off the roadway into the woodline and struck a large tree, causing significant damage to the front end," New Hampshire State Police Lt. John Hennessy said. "Most of the children did have seat belts on." The driver, an 18-year-old counselor and a 10-year-old child were hospitalized with serious injuries, but they are all expected to survive. The 10 remaining passengers on the bus were transported to Exeter Hospital as a precaution. "One patient has been transferred to Boston," said Debra Vasapolli, the public relations director for Exeter Health Resources. "Eight have been discharged with their parents and the last one will be discharged shortly in the care of their parent, as well." State police say at this time it does not appear that speed was a factor in this crash, however all aspects remain under investigation. The bus was from the Kittery Community Center and was carrying Maine children who are part of a summer day camp. 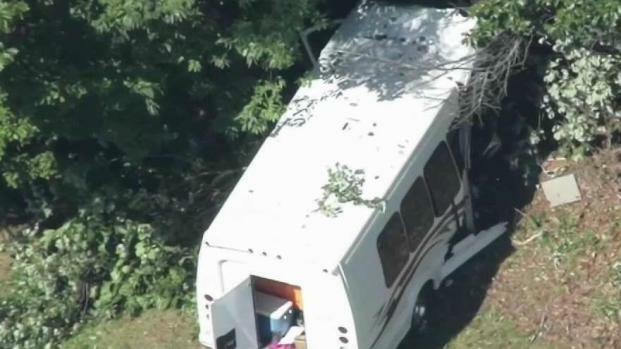 The camp is run by the town of Kittery, Maine, which its town manager said the parents of all the children on the bus at the time of the crash have been notified by the town. "The Town of Kittery is grateful to the bystanders and first responders for their quick action in the care of our program participants and employees," Kendra Amaral, Kittery town manager, said in a statement. 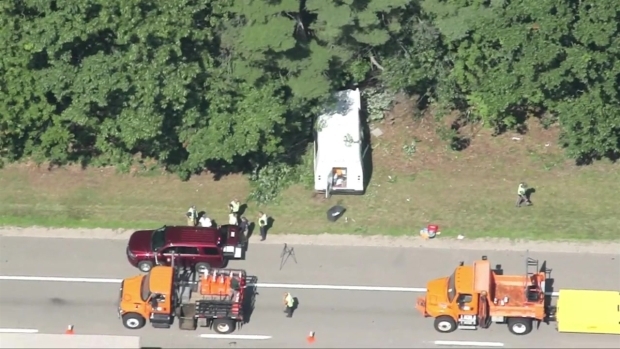 Sky Ranger was over the scene where a bus transporting 10 children went off Interstate 95 in Greenland, New Hampshire and crashed into a tree; state police say it appears the bus driver had a medical episode. Beth Bradstreet told NBC10 Boston she was in her car when she heard about the school bus crash in Greenland, and immediately thought of her two young boys spending their summer days at the Kittery Community Center, knowing they were going on a field trip Friday. But she found out from officials at the scene that her children weren't on the bus and the children who were are expected to be OK.
"It's just panic. You hope that it's nothing serious, and you hope that everybody's OK, you hope it's not your kids," Bradstreet said. Bradstreet's kids were on the field trip through the Kittery, Maine, Community Center SAFE Summer Campp program. Her children's van was not involved in the crash and they continued on to a water slide park in Candia. "I'm still shaking," Bradstreet said after the crash. "My kids' friends are on that bus, they go to school with them, they spent the summer with them." New Hampshire Gov. Chris Sununu said his administration is monitoring the response and is working with the responding agencies. "The safety of those involved in this accident is our top priority," he tweeted. Several lanes were closed after the crash, the New Hampshire Department of Transportation said on Twitter.